Hornet is an unincorporated community in western Newton County, Missouri, United States. It is located approximately six miles southwest of Joplin, less than one mile west of Route 43. The community is part of the Joplin, Missouri Metropolitan Statistical Area. West of Hornet is the famous Hornet Spooklight, which is a few miles west at the Oklahoma state line. A post office called Hornet was established in 1882, and remained in operation until 1902. According to tradition, the local country store was as busy as a "hornet", hence the name. ^ Norman, Michael; Scott, Beth (18 September 2007). Haunted Heritage: A Definitive Collection of North American Ghost Stories. Tom Doherty Associates. p. 266. ISBN 978-0-7653-1968-5. ^ "Post Offices". Jim Forte Postal History. Retrieved 22 November 2016. ^ "Newton County Place Names, 1928–1945". The State Historical Society of Missouri. Archived from the original on June 24, 2016. Retrieved November 22, 2016. 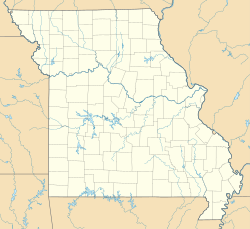 This Newton County, Missouri state location article is a stub. You can help Wikipedia by expanding it. This page was last edited on 3 January 2019, at 07:20 (UTC).